"Hi Today I received this Item. When i open the box the whole Laptop smells like it was kept deep inside tobacco bag. It is smelling like hell. I am surprised you did not mentioned this in your listing about this issue. I bought this laptop for my daughter and in no way i can let her work on this laptop. I would like to return this item as it is impossible for me to work on this laptop. Let me know"
"Smells like a tobacco bag!? Why would it smell that way? I do NOT smoke nor does anyone in my home. The laptop did NOT smell this way when it was packaged. This complaint makes absolutely no sense. I took great care of that laptop and packaged it very well for shipment to you. It was double boxed and surrounded by foam. Are you confusing the alcohol cleaning wipes scent for tobacco? This laptop had never been around tobacco at all." I should have taken pictures showing how insanely well this item was packaged. Far better than is was packaged when it was sent to me by the manufacturer. I will certainly post more on this as it develops. 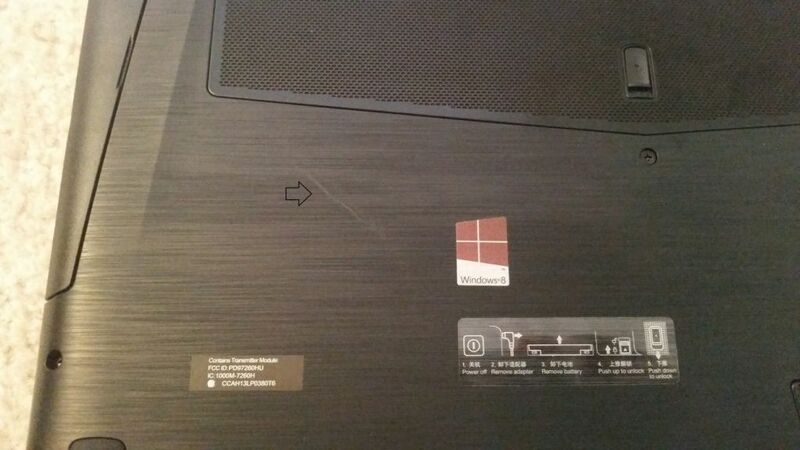 This laptop also has few light scratch, lot of scuffs and some Greece type thing on back hings of this laptop. i am not sure if it is even safe to touch this laptop. This laptop was sent to you in exactly the condition I listed in the auction: "Used,like new condition. No scratches or scuffs". Your mention of grease on the hinges is another baseless claim. This condition did not exist when I packaged it. This laptop was wiped down with alcohol wipes, which evaporates over time. Indicating that the laptop is not safe to touch is offensive. I do not maintain a 100% rating by fooling buyers or selling/shipping items incorrectly described. The auction clearly states that I do not accept returns. At this point, even if I did, I would not accept the laptop based on how it appears to have been treated since you've received it. "Dear Seller, Do you think i am fool. It is 100% Tabacco smell and not a alcohol wipe smell. I am a honest person and that reflect with my ebay ratings. It is very easy to cover up by saying all these lines . This laptop is not As described. It has light scratch on the base,hings has something applied on it , lots of Scuffs and Smell like hell. You have tired to cover up scratch and scuffs with what you call alcohol wipes but it did not help. No way this laptop looks new to me. Also, mentioning me that i miss handled this laptop within one hour it was delivered shows that you are trying to put all blame on me. I will now ask eBay to look into this matter as i know sellers like you who tries to sell stuffs on ebay with all false claim and then try to put blame on buyers. " "I am not attempting to insult your intelligence or imply that you are a fool. I am telling you that this laptop did not smell that way when I shipped it. I DO NOT SMOKE. There is no way this laptop would have gotten exposed to tobacco in my home and that is the only place this laptop ever physically was. I am not attempting to cover up anything. I shipped you a laptop in fantastic, Used - Like New, condition. It is unfortunate that you feel that I am trying to blame anything on you. I am adamant in standing behind the condition being exactly as described when the laptop was shipped. That is the last time I had it in my possession. I have no way to verify if you have or have not harmed the laptop. All of your claims are assumptions. I have done nothing that you have stated. Continue your conversations with eBay and rest assured that I have contacted them about you on this matter as well. " At the point I guess it is in eBay's hands. I don't if there is anything else that I can do. I really hope that there really is some form of Seller Protection like they say. Hypothetically, if I am forced to take this laptop back and issue a full refund, how in good conscience will I be able to attempt sell this again not knowing what has happened to it? "I am not attempting to insult your intelligence or imply that you are a fool. I am telling you that this laptop did not smell that way when I shipped it. I DO NOT SMOKE. There is no way this laptop would have gotten exposed to tobacco in my home and that is the only place this laptop ever physically was. I am not attempting to cover up anything. I shipped you a laptop in fantastic, Used - Like New, condition. It is unfortunate that you feel that I am trying to blame anything on you. I am adamant in standing behind the condition being exactly as described when the laptop was shipped. That is the last time I had it in my possession. I have no way to verify if you have or have not harmed the laptop. All of your claims are assumptions. I have done nothing that you have stated. Continue your conversations with eBay and rest assured that I have contacted them about you on this matter as well. " 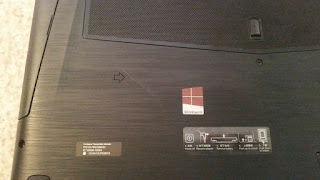 "Your are welcome to attach pictures of the laptop, showing the issues that you've pointed out. If you choose to do so, please also so the serial number." "I have attached the photos as you requested. Let me know if you need any more details for this laptop. i have not switched it ON yet hence i don't know what is loaded in it. It is kept in box in which it came just took it out to take pictures. " 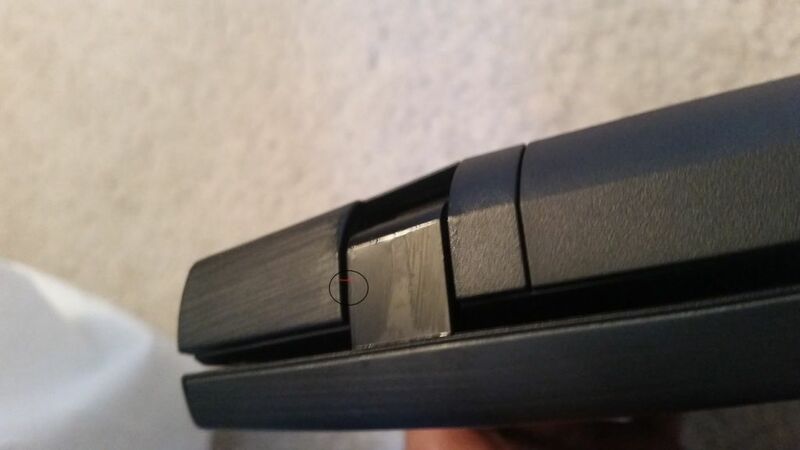 The pictures that the Buyer attached do show super light scuffs and it looks like he smeared something on the hinges. No way I would ship this all greased up. "I don't know what is on the hinges or where the scuffs came from. None of that was present when I packaged it up. Honestly I would have disclosed it if it were. Does the substance on the hinges wipe off? I wonder if something happened during transit." "I have not tried to clean anything in this laptop. First time i touch it it fell like grease and i just washed my hands. I don't want to touch anything in this laptop. That is the reason the very first thing i did as soon as I open this box and saw these issues , I went online and emailed you about the issue. Did u see those scuff ( or scratch) what ever u call them on back and lower body of laptop. " "As I was saying - there were not any scuffs when I packaged this laptop. It literally sat on my desk on top of a cardboard box. It never came in contact with anything. " "In an attempt to resolve this matter. Would you be willing to accept $25 back from your purchase and you keep the laptop? I sold this laptop for $900. This laptop new costs $1150 + $99 2 year warranty. Plus the tax and shipping I paid when I bought it from Lenovo. Additionally, I am paying the $93 fee to sell it on eBay. Even further I paid an additional $12 to ship it than you paid. My loss on this transaction is already quite high. -You show a substance on the hinges ; Possible residue from the alcohol wipes(commercial grade) is all I can think that this is. It should wipe off very easily. We seem to be at an impasse otherwise. " "Are you kidding by giving me $25 back . I want to return this laptop and get back my full return plus shipping cost to return it. This not the item i have expected for $916. If i have to buy this laptop in this condition(Smell, scuff and grease )i would have not payed more than $600 max. " "I am not accepting a return of this laptop in a condition that I did not ship it in. Everything you have claimed is not the state that it was shipped in. It was immaculate. The only thing that made it "Used - Like New" instead of "New" was the fact that it wasn't in a sealed box. It was barely even used. Like I said, the "smell" you claim is unfounded. I do not smoke and the laptop never left my house. It did not smell when it was packaged. IF eBay forces a return of this item, I most certainly will not be paying for your return shipping. Note that the auction clearly states that I do not accept returns. To be perfectly honest, the "scuffs" you claim are so minor they do not warrant a 50% cost to a virtually brand new laptop. The scuffs were not there when it was shipped. You have been rude and assuming through this entire transaction. From now on I will be taking the maximum allowed photos for an auction as a safe guard." I am at a loss for words at this point. "Stop blaming others. Just buy listing Used- Like new and making fool of people who trust on seller like you. I have provided photos to you as you asked for and now u are saying wipe it out that grease thing, scuffs/ scratch are very small. As a buyer I need what I have paid for. Dear $916 dollars are a huge amount. I bought a brand new car used it for few months and the sold it with 20% depreceated value. So pls dont give me all this story taht I spent this and that. I will ask ebay now to look into this case. I did not ask you to refund $300 or $400 bec than you might have made another story." "Like I said: "You have been rude and assuming through this entire transaction." It is entirely up to eBay now. I will not correspond with you any further." Let's see where eBay takes this. "I am sorry if you felt like that. I am just asking you to refund my full money. Picture don't lie. If asking for refund is rude that let ebay take care of this issue. I will again say this laptop is not worth more that $550 to $600. I give you two option ( sorry if you again feel I am being rude). I will send you back this laptop and you refund me full amount with return shipping or second option is you refund me $350 and I will keep is laptop. If you don't agree to either offer, let ebay take care of this issue. I bought this laptop for my daughter and now she cannot work because of the this issue. " "As I stated already, it is up to eBay now. I see your angle now... You buy an immaculate laptop... say that is smells(no way to prove/disprove this), place minor scratches that in now way affect the function of the laptop, then apply a little grease to the hinge(which can later be easily wiped off)... then offer a solution of refunding 38% of the purchase price? Absolutely not. It is entirely up to eBay at this point. " "OMG I am shocked with full of your allegations. You are one crazy person. Let eBay decide ." We're sorry there was a problem with this transaction. After reviewing the case, we made a final decision in the buyer's favor. This case has been decided in the buyer's favor. The buyer has been asked to return the item to you. Once tracking shows the item has been delivered to you, the buyer will be issued a full refund. As per eBay decision I am going to return this Item to you. I request you to PLEASE provide the return shipping label. If not then i may have to leave a negative feedback for you only because in this whole transaction i at loss. Your choice. let me know." You're going to leave negative feedback regardless. Do NOT contact me again." Ok - So... I spoke to eBay. I will be getting the selling fee back within 72 hours of initiating the refund. The girl I spoke with(American btw) was polite and did NOT speak from a script. 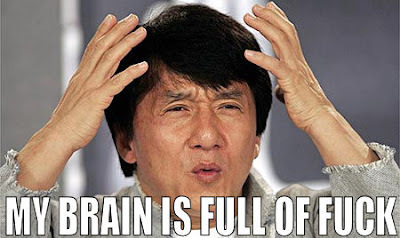 She advised that when you list an item as Used(even Used Like New) - eBay assumes that there will be scuffs. They do not cover smells since "what smells to one person doesn't smell to another". Not having pictures was NOT the downfall. The downfall is that I accurately described the condition as "No scuffs or scratches". If I had not written that, eBay would have chalked this up to buyer's remorse and denied the refund. In the end: I am losing $12 in shipping and I now have a scratched laptop. The buyer(asshat) is out the return shipping cost. So folks - I want to be pissed at eBay but in truth it is lesson learned... Practice due diligence to protect yourself from asshats. Getting to a person when I called in less than 10 seconds that spoke my language and was polite and personable has saved me from denying eBay my business ever again. Now... who wants to buy a laptop? "The laptop arrived. I have issued your refund in full. This has been an unfortunate dealing for both of us. We both lost money in the process. I'm sure it doesn't mean much to you but I'm being honest when I say those scuffs weren't there when I packaged it, so I don't know what happened in transit or after. There was no smell and no grease when I unboxed it. I have left you a positive feedback as you did pay promptly, regardless how this turned out. In the future, I would suggest that you don't jump to conclusions so quickly. Your assumptions were that I was trying to screw you over. In the end what appears to have happened is that two honest eBayers had a bad transaction. Good luck and I hope you find the laptop you want for your daughter,"
" The way you listed this laptop and sold it to me and then all your allegations on me. I asked you to pay for return shipping but you used some hard words as if it was all my fault . Now that reflects in feedback"
eBay said they'd remove it. The lady I spoke with said "You've done everything you could to resolve the situation... I would have removed it anyway, but the buyer went as far as threatening negative feedback if you didn't pay for return shipping. That isn't right"
Might be 24 hours before the removal takes effect. Geez - so happy this is over.